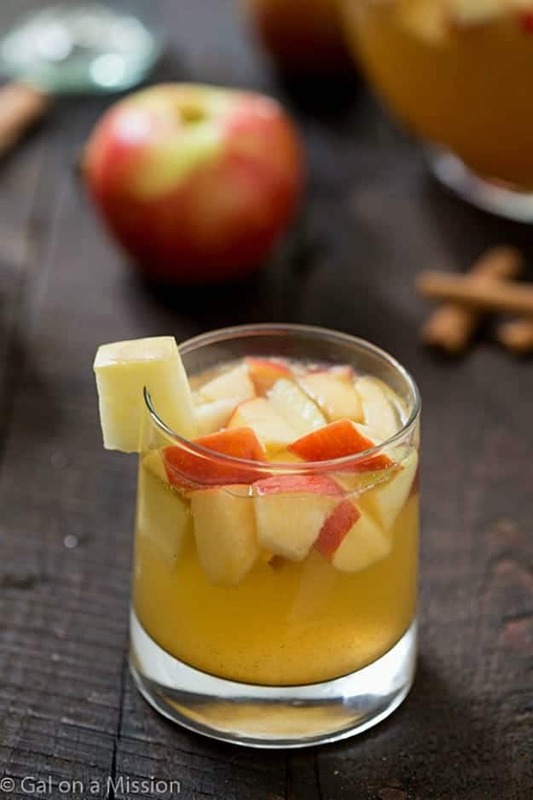 Apple Sangria – The perfect cocktail for busy holidays to relax with friends and family. Hints of honey crisp apples, caramel, apple cider, and cinnamon! Lately, I have been in love with sangrias. All kinds, different varieties of wines and fruits. Who doesn’t love nibbling on fruit while you are sipping on a cocktail? I do! 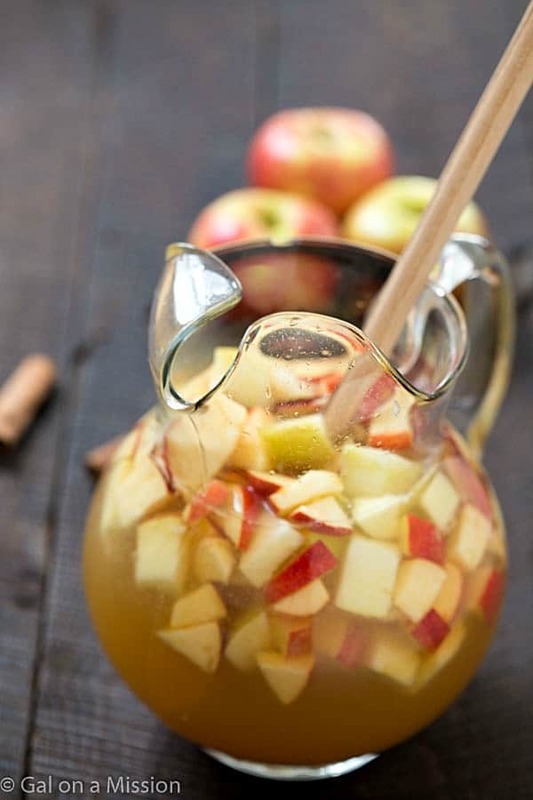 I thought an apple sangria would be perfect this fall. It’s great for get-togethers with friends and family during the holidays. Everyone always seems to be so busy during the holidays. It’s great now and then to get together with close friends and family for a cocktail to remember all of the great moments in each others lives. Get time to reflect and wind down. A glass of apple sangria will also be great to wind down after a long, hectic week. I love cozying up in a big armchair with my feet kicked back wrapped in a fluffy blanket with my nose in an excellent book. You too? Sounds like the perfect fall Friday to me! 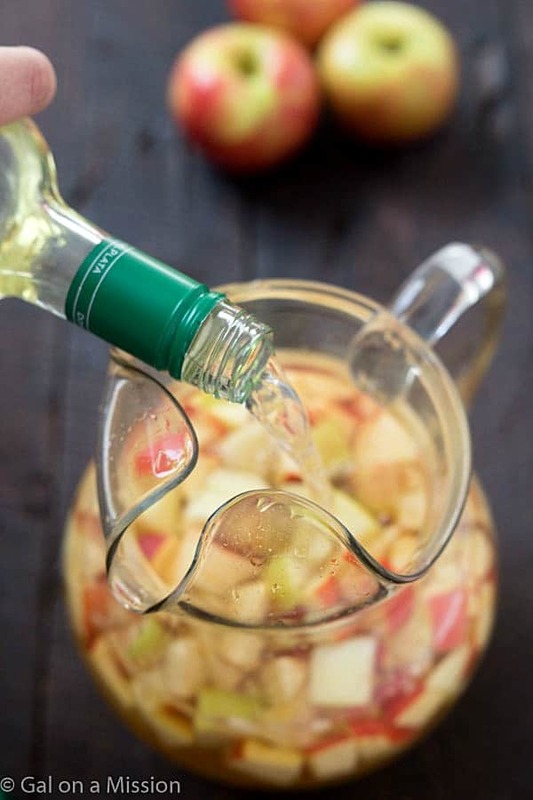 This apple sangria is super simple to whip up with minimal ingredients. I will have to let you know, it’s best to let the sangria chill in the refrigerator for at least 24 hours. That allows the apple chunks to absorb the liquid and makes it delicious. 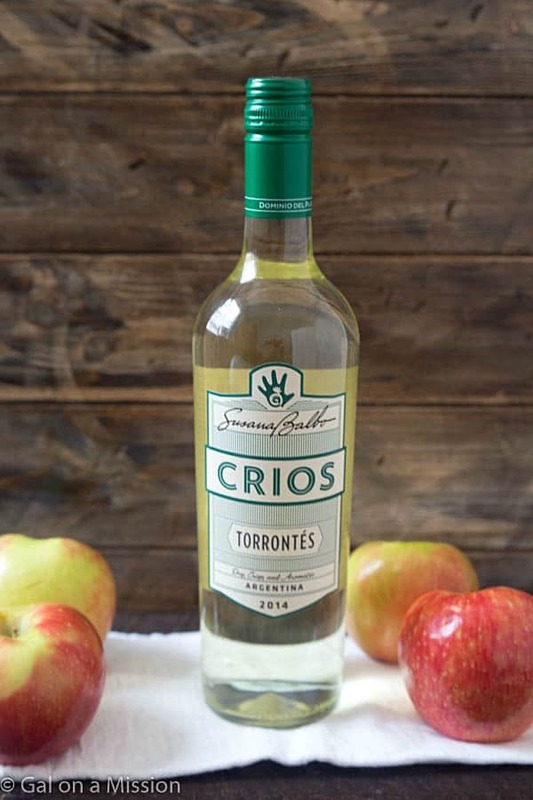 The wine I choose for the sangria is CRIOS TORRONTES. It’s an Argentina wine made from their standard blending grapes, Torrontes. It’s dry, crisp, and very aromatic. Defined by it’s crisp notes of white flower, pear and ripe peaches – yum! We love Crios because it’s a family-owned brand by Susan Balbo, Argentina’s leading and most innovative winemaker. If you were wondering what Crios means, it means offspring in Spanish and was created by Susan as a tribute to her son and daughter. I love the family history behind the wine. Crios wines are harvest from specific areas in Mendoza and Salta in Argentina, where the grapes are optimal for the fruit-forward style of wine. Did you know each wine carries an inspirational message that also represents either a milestone in Susana’s personal and professional life or the story about how the wine was made? Neat, right? You can find many varieties of Crios: Torrontes, Rose of Malbec, Cabernet Sauvignon, Malbec, and a Red Blend. Place the diced apples into a large glass pitcher. Pour the apple cider, club soda, caramel vodka into the glass pitch and stir. Pour the wine into the glass pitcher and stir. Add 3-4 cinnamon sticks to the mixture and stir. Place the sangria into the refrigerator to chill for at least 24 hours. Serve with a tumbler glass with the sangria and fruit. Add a slice of apple to the rim. *You may add the club soda after the sangria has finished chilled in the refrigerator for at least 24 hours.